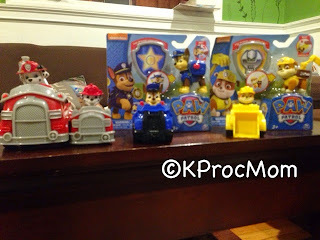 Are you kids obsessed with Paw Patrol? 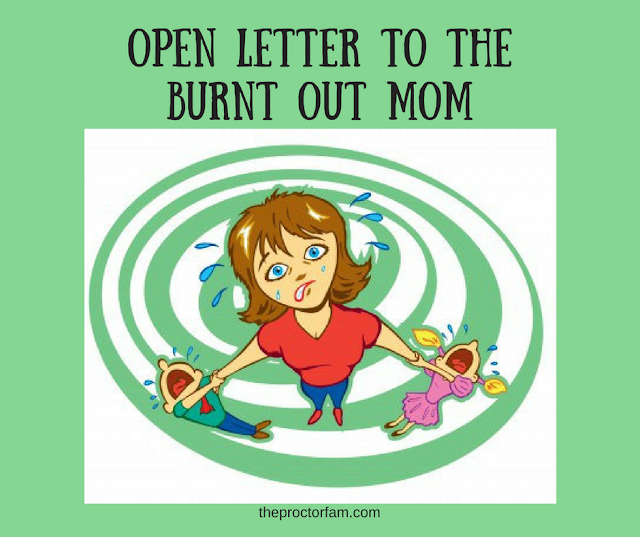 Do you know what it is or were you living under a rock like I was up until a few weeks ago? Jack introduced me to Paw Patrol, he started watching with the babysitter on Nickelodeon. Spin Master, the company who makes Paw Patrol toys also makes How to Train Your Dragon 2 Toys and IONIX building blocks. Those toys were my first introduction to the company but then at Blogger Bash, I met with Spin Master and learned they also made Paw Patrol!! 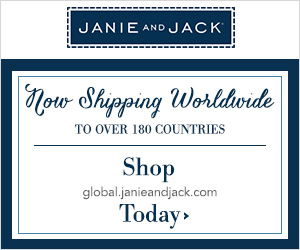 Hello new must have brand that makes my kids favorites right now. the characters including a girl character for my daughter, even though she is in love with Chase and Marshall too. The show covers multiple professions and they toys are great for budding imaginations and storytellers. 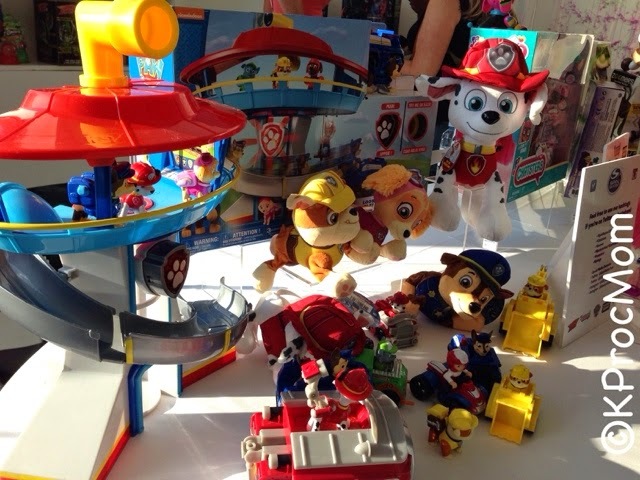 Jack & Charlotte incorporate Paw Patrol play with their blocks as Rubble plows over a wall they built or Marshall comes along to put out a fire at the doll house, and the best part- kids play together NICELY. Do your kids recreate scenes from their favorite shows/movies? The many choices of toys will help your kids with that. 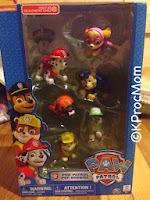 Paw Patrol toys by Spin Master are found at many stores. I have found ours at Target, Walmart and Toys R Us, they are "hot" right now so I have had to search around and keep checking back in at stores. We have lucked out though by our growing collection lately. 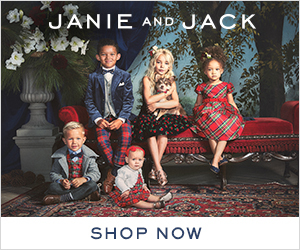 If you think your child would enjoy these, I suggest stocking up whenever you see them in stores for upcoming holiday season. They have only been in stores a little more than a month and have been consistently sold out in stores around me. The soft Marshall stuffed dog talks. PP Real Talking Marshall is adorably soft and has phrases and sounds for the show. Jack has been sleeping nightly with him, he loves that he is a firefighter like his dad, keeping him extra close. All it takes to active him is a squeeze of the tummy. 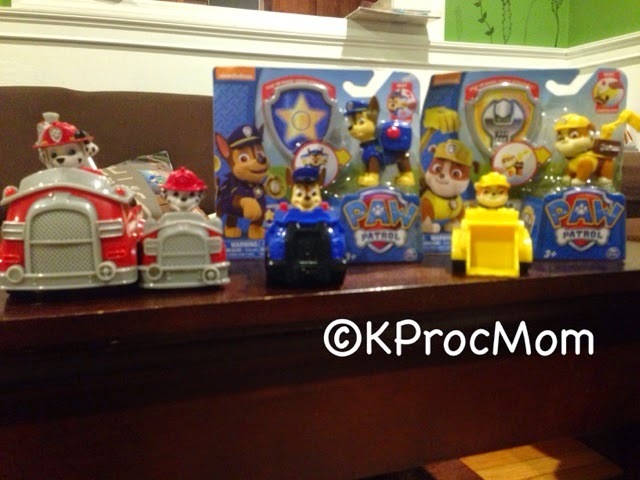 Paw Patrol Racers: These come in a variety of characters from PP, we have 3 so far, it's a car with the matching character the kids can push on floor and race. Best of both worlds as it comes with figure in a car (although it cannot be removed) it does provide entertainment for the kids to play with. Marshall because he builds and puts out fires"
PP Marshall's Fire Fightin' Truck: This set is a character which can sit in or next to the fire truck, two pieces. My kids love racing over fire truck with. Marshall inside, pulling him out at the fire so he can help save the trains/minions/dolls/planes/etc. they love to use their imagination. 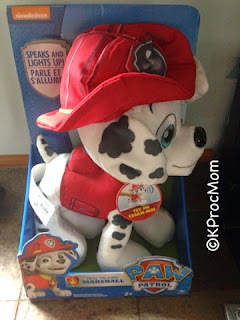 PP Action Pack Pup & Badge Toys: These come with badges for the kids to wear on their shirts and the action figure. The badge on the dog's collar pops up their signature move, Rubble has a digger claw, Marshall a ladder and Chase crowd controlling megaphones. We have these three and still collecting the other 4 figures. 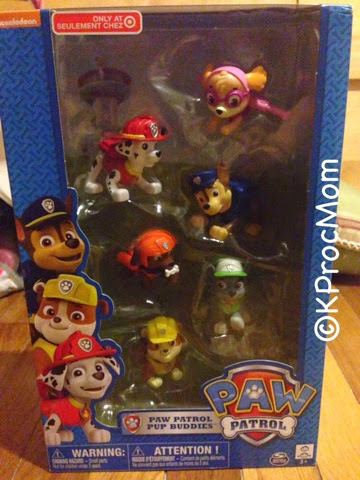 Of course with all these toys we HAVE to have the Paw Patrol Look-Out Playset so all the pups and Ryder have a place to hang out. 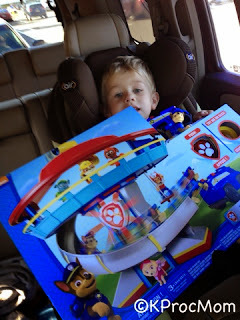 I have always gotten the play set for any toy collection my kids have owned. It brings everything together for playing. Even with it they still use the pups playing with other toys, like I said knocking over blocks, putting out dollhouse fires, etc. Disclosure: we were sent Real Talking Marshall for review, all others were purchased myself and as always all opinions are 100% my own and honest.